(Nanowerk News) A pioneering, multi-institution research center headquartered at Duke's Pratt School of Engineering has just won a $15-million grant renewal from the National Science Foundation and the US Environmental Protection Agency to continue learning more about where nanoparticles accumulate, how they interact with other chemicals and how they affect the environment. The nanomaterials revolution has made exceedingly tiny engineered particles a hot commodity, used in products from clothing to sunscreen to electronics. 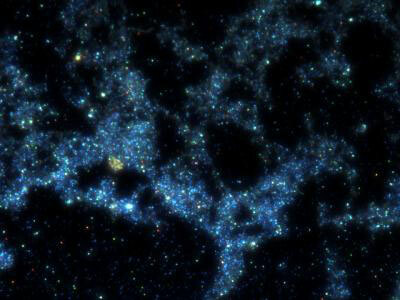 But the very properties that make them so useful -- vanishingly small size and high surface area -- may have unintended consequences as they enter living organisms and the environment. Founded in 2008, the Center for Environmental Implications of NanoTechnology (CEINT) has been evaluating the effect of long-term nanomaterial exposure on organisms and ecosystems. 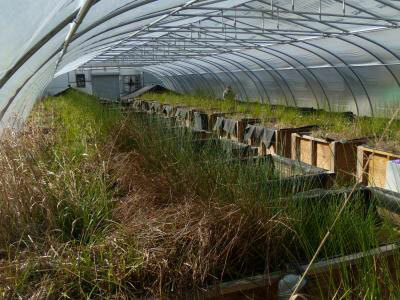 Located in the Duke Forest, these mesocosms simulate wetland environments as a living laboratory for researchers studying nanoparticles. "As we look to the next five years, we will be evaluating more complex nanomaterials in more realistic natural environments such as agricultural lands and water treatment systems where these materials are likely to be found," said Mark Wiesner, James L. Meriam Professor of Civil & Environmental Engineering and director of CEINT. The center has been exploring what happens when nanotechnology materials manufactured at the nanoscale -- about 1/10,000th the diameter of a human hair -- enter the environment and whether their size and unique properties render them a new category of environmental risk. For example, nanoparticles can be highly reactive with other chemicals in the environment and had been shown to disrupt activities in living organisms. Indeed, nanosilver is used in clothing precisely because it effectively kills odor-causing bacteria. The center also pioneered the use of a new test chamber, called a mesocosm, that replicates a small wetland environment. "Over the long term, we want to evaluate how nanoparticles bioaccumulate in complex food webs," said Emily Bernhardt, an associate professor of biology at Duke and ecosystem ecologist who helped design the simulated ecosystems. "The additional funding will allow us to study the subtle effect of low-dose exposure on ecosystems over time, as well as complex interactions among nanoparticles and other environmental contaminants." The funding renewal comes from the National Science Foundation (NSF) and the Environmental Protection Agency (EPA) under NSF Cooperative Agreement EF-0830093. hown here are specially coated silver nanoparticles floating in mesocosm water. The average diameter of the nanoparticles is 55 nanometers, or 55 billionths of a meter, but variations in size cause them to reflect different colors as shown in the image. CEINT scientist Michael Hochella, a geoscientist at Virginia Tech, inventoried nanoparticles and concluded that natural nanoparticles are found everywhere, from dust in the atmosphere to sea spray to volcanoes. The environmental risks of these natural nanomaterials are difficult to separate from engineered nanomaterials. Gregory V. Lowry, deputy director of CEINT and professor at Carnegie Mellon University, Pittsburgh, along with colleagues from the University of Birmingham, U.K. and the University of South Carolina found that the relatively large surface area of nanoparticles makes them highly reactive once they enter the environment. These transformations will alter their movement and toxicity and must be considered when studying nanomaterials. Their review article on this topic was named the best feature article of 2012 by the journal Environmental Science and Technology. A research team led by CEINT investigators Jie Liu, associate professor of chemistry at Duke, and CEINT Director Mark Wiesner showed that more than a dozen types of engineered nanoparticles, including silver, gold, and titanium dioxide, along with carbon nanotubes, can be surveyed using a technique called hyperspectral imaging, which measures light scattering caused by different types of nanoparticles. The new technique, co-developed by postdoctoral researcher Appala Raju Badireddy, is sensitive enough to analyze nanoparticles found in water samples ranging from ultrapurified to wastewater. It will be used in future long-term studies of how nanoparticles move and accumulate in ecological systems. Understanding the volume of nanomaterials being produced and released into the environment is a crucial factor in risk assessment. CEINT researchers led by Christine Hendren, CEINT executive director, measured the upper- and lower-bound annual U.S. production of five classes of nanomaterials, totaling as much as a combined 40,000 metric tons annually as of 2011. CEINT has developed "mesocosms," open-air terrarium-like structures that simulate wetland ecosystems that can be evaluated over time. Even low doses of silver nanoparticles used in many consumer products produced about a third less biomass in a mesocosm. The researchers will now look at how nanomaterials are transferred between organisms in a mesocosm. The Center for the Environmental Implications of NanoTechnology (CEINT) is funded by a $15 million grant from the National Science Foundation (NSF) and the Environmental Protection Agency (EPA) under NSF Cooperative Agreement EF-0830093. CEINT is exploring the relationship between a vast array of nanomaterials? from natural to manufactured to those produced incidentally by human activities?and their potential environmental exposure, biological effects and ecological impacts. Headquartered at Duke University, CEINT is a collaborative effort among researchers from Duke, Carnegie Mellon University, Howard University, Virginia Tech, University of Kentucky and Stanford University. CEINT academic collaborations include ongoing activities coordinated with faculty at Baylor, Clemson, North Carolina State and North Carolina Central universities, with researchers at NIST and EPA government labs, and with key international partners.